Our Kids at Home: 04.05.06.07.08.09 party! today we were invited to a 04:05:06 pm on 07/08/09 party! those 2 red beauties were yummy! our first fruits of the garden. we have been enjoying cucumbers for a few weeks but these guys are awesome. nothing like that taste of a home-grown tomato. 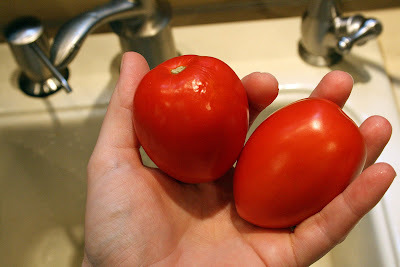 What beautiful tomatoes and not a blemish on them. I can only imagine how good they must taste.